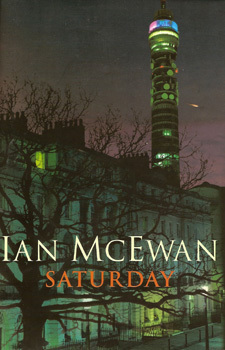 The task of writing up Ian McEwan's Saturday (Jonathan Cape, 2005) has loomed forbiddingly over a difficult weekend, and before tackling it I have had to banish any idea of doing the novel justice. Although not without incident, Saturday is less a conventional novel than a heroic sculpture, a David for our times, a portrait of a man in full. Beyond that, however, I have no comprehensive insights, so I shall fall back on that old (but readable) crutch, "random notes." ¶ According to a piece in the Times by Charles McGrath just over a month ago (Archive), Saturday is stocked with autobiographical references - not a hallmark of Mr McEwan's earlier fiction (rather the reverse). Henry Perowne, a forty-eight year-old neurosurgeon, actually lives in Mr McEwan's house in Fitzrovia. There is something about the prose that from the start invites an identity of author and character; perhaps this something is the way in which Mr McEwan substitutes details for summaries; the quiddity of a life is palpable beneath the page, such that one can almost smell Henry. But there is a bigger difference between the two than their respective professions. Henry Perowne is not a reader. Although he has fine taste in art and music, an innate grasp of the graceful that makes him a success in the operating room, he cannot attend to imaginative fiction. Novels, to Henry Perowne, are long and opaque. The text is dotted with periodic references to this trait, which I hesitate to call a defect even though I certainly feel that it is one. Henry's mother, Lily, lives in a home for Alzheimer's victims, and in the middle of his Saturday Henry pays her a visit. It is excruciating for him to follow the chain of her shardlike memories; we are not brought up to respond to nonsense with cheerful politeness. Lily is stuck in a jam of moments that are neither of the past nor of the present but that confuse the two with a stubbornness that dismays her son. And yet by the time I reached this passage - which I had read, excerpted, in Granta some time ago (just as I had read the Dunkerque section of Atonement in advance) - I was struck that Henry, too, is stuck in a moment that shifts between memory and present perception. There is little imagination in Henry's mind. Perhaps that is for the best in a neurosurgeon. Perhaps imagination is distracting. But it is also, indisputably, enlarging, the means by which the minds appropriates the world around it, instead of simply reacting to it. Continue reading about Saturday at Portico. Goodness, yes, I really wanted to read this before, but now...I MUST. "Liberal"'s Just Another Word For "Gay"